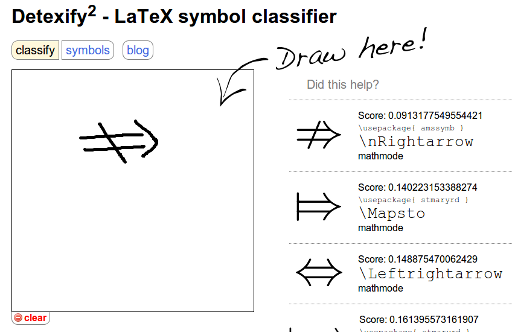 Detexify - A webservice for finding LaTeX symbols. $\leadsto$ \leadsto $\mapsto$ \mapsto . . . .
$\Phi$ \Phi $\varphi$ \varphi . . . .
$\Lambda$ \Lambda $\Delta$ \Delta . . . . I've recently needed \(\dots, \ddots, \vdots\) (\dots, \ddots, \vdots) for a visualization in a matrix. Note that you can write ... instead of \dots, but you'll lose the semantics.